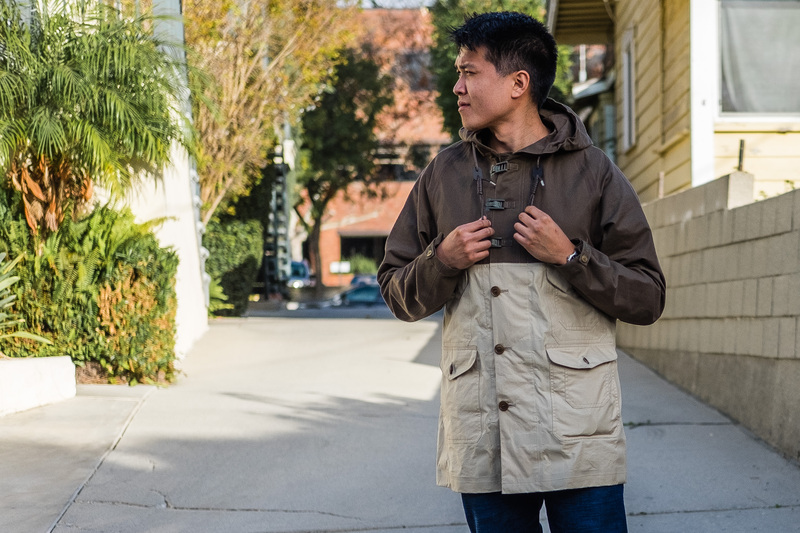 I’ve read Well Dressed Dad’s Review on the iconic Cameraman Jacket over a few times, and while I loved the design, I couldn’t justify the full price especially living in Los Angeles where its warm year round and rarely rains. The Cameraman Jacket is the second piece from Nigel Cabourn that I own, with the first being a Filson x Nigel Cabourn Soft Hunting Jacket. 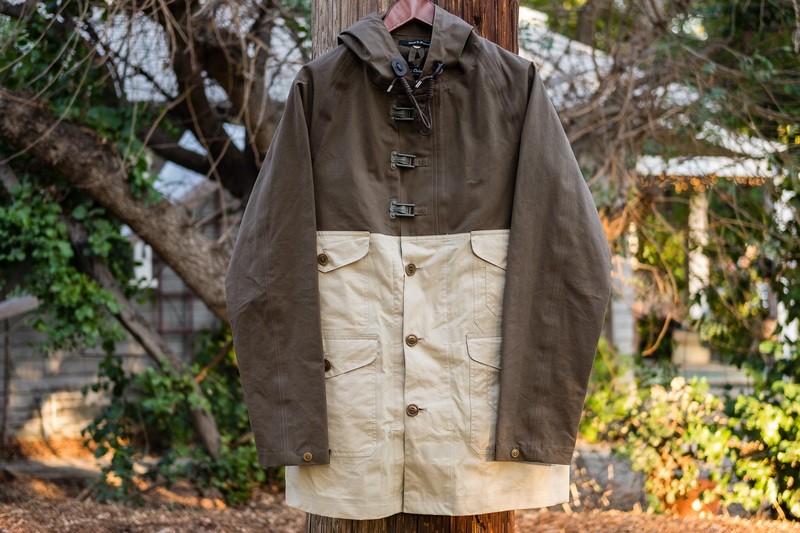 I may eventually post a review of that jacket also, but essentially it takes elements of Nigel Cabourn’s Mallory Jacket design and was produced by Filson. 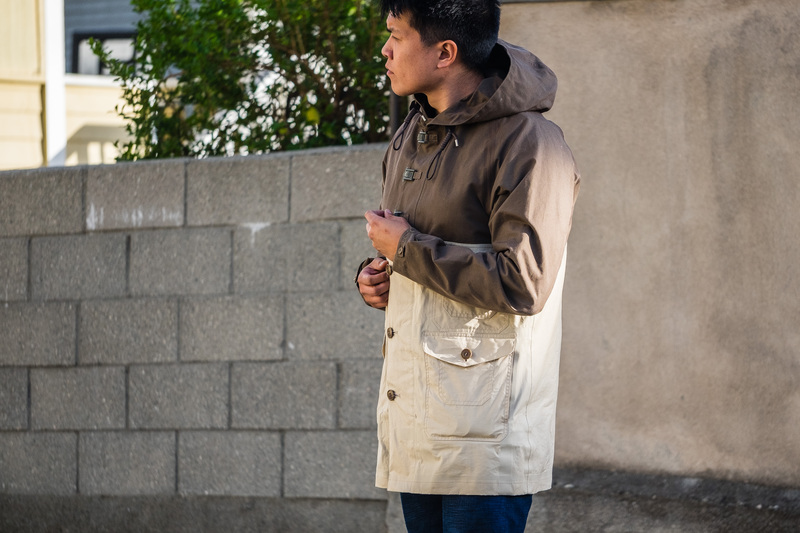 The collaboration happened in 2014, and was a great way of having a Nigel Cabourn piece at a more affordable price. 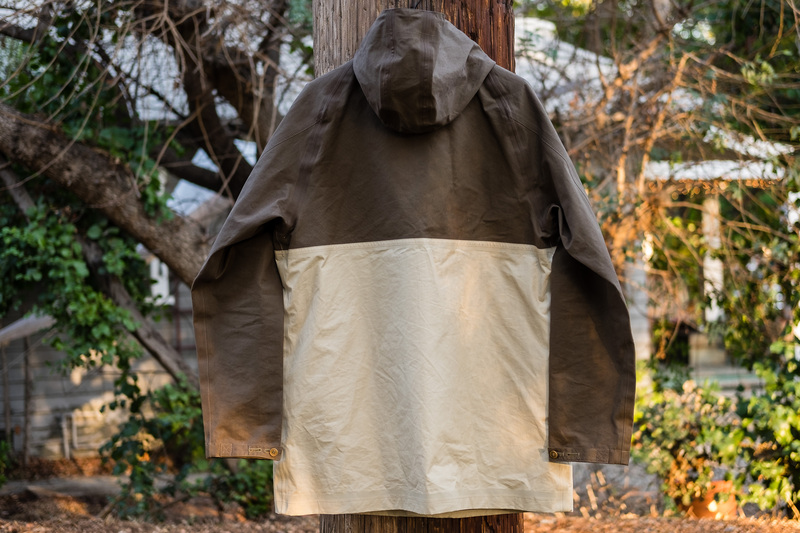 The Work Cape was the piece I was eying for the longest time after the release, but felt that the wool and waxed cotton was too much for my weather. The Cameraman colorway that I’ll be reviewing is from AW13 with a detachable Harris Tweed Vest. Instead of a traditional Mackintosh upper and Harris Tweed bottom, both top and bottom are L27 and L34 Ventile cotton, with fully taped seams for water and wind resistance. 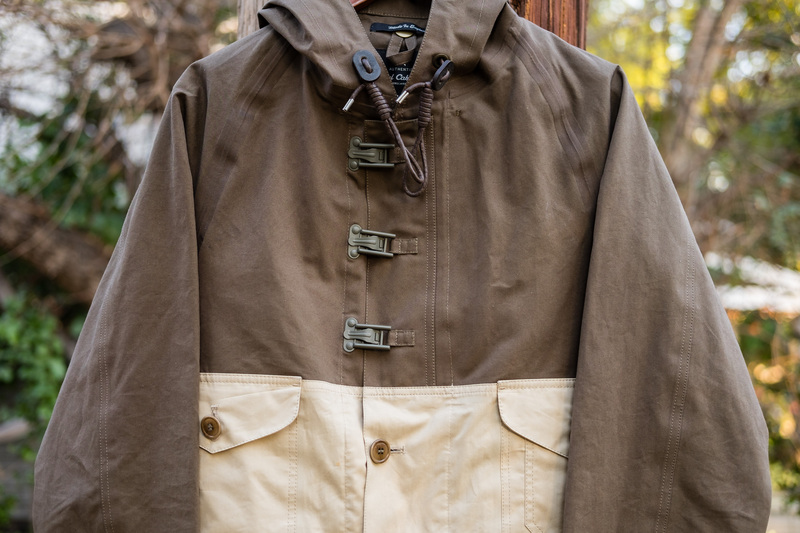 Ventile fabric has recently been reintroduced by heritage brand such as Nigel Cabourn, SEH Kelly, and Private White VC. Ventile Cotton was used in RAF pilot garments to repel water increasing the pilot’s life expectancy in the ocean once they ejected. The fabric is 100% densely woven cotton and is essentially water-resistant by the cotton fibers swelling and constricting the pores! 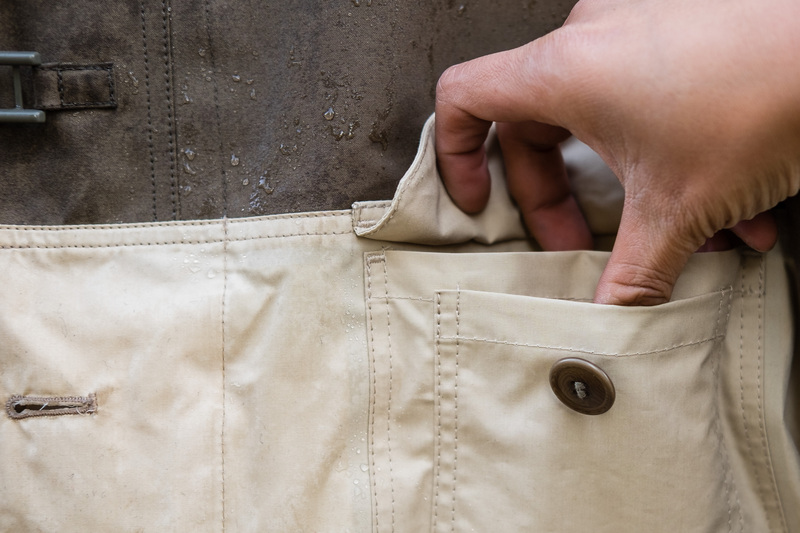 Nowadays, Ventile is additionally treated with a Durable Water Repellant DWR coating for enhanced resistance. I won an auction on eBay brand new with tags from a consignment store for $391 USD shipped. Testing the water resistance with a spray bottle! Pretty well! Most of the water beaded off. The interior was completely dry! Constructed from Ventile cotton, a technique used by the RAF in WWII, it is sealed with genuine Ventile tape making it lightweight and flexible yet incredibly durable, ensuring 100% protection from wind and rain. This new version for 2013 comes equipped with a genuine Harris Tweed vest acting as a lining, closed with horn buttons and secured in place with branded press studs. The level of authentic detailing on offer is incredible, with no expense spared with the inclusion of natural horn buttons and US Military edition metal clip closure. The reason I was interested in this makeup was because of the neutral colors and gentile cotton. The eBay seller’s pictures weren’t representative of the true colors when I received the garment. The “Army” looked like a brownish olive and the “Stone” looked like a beige. Regarding Ventile Cotton, the first time I heard of it and felt a garment constructed of it in person was as a Private White VC jacket at Standard & Strange sometime in 2013. The associate splashed water on the jacket and the water beaded right off! The price of the Private White VC jacket was around $700USD. A lot of the premium price has to do with branded Ventile only being manufactured in one place in the world – Switzerland. For a rain garment, there are several material options available. Waxed cotton has been around used for the longest time. Sailors realized when they applied paraffin wax to their sailcloth, it provided both wind resistance. 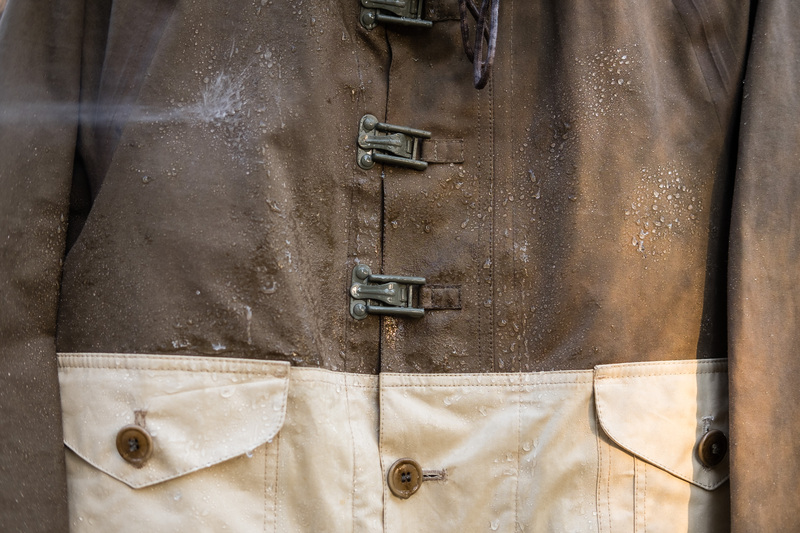 Most common heritage brands using waxed cotton today is Filson, Barbour, and Private White VC. 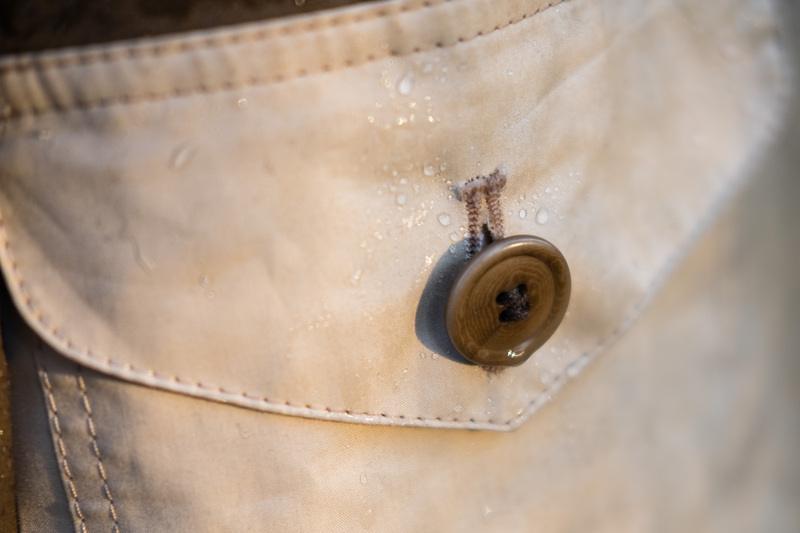 Waxed cotton garments are quite effective in repelling water and develop an amazing patina. Cons of waxed cotton is that it smells funky and needs to be reapplied every season or so. Waxed cotton is not very breathable either. 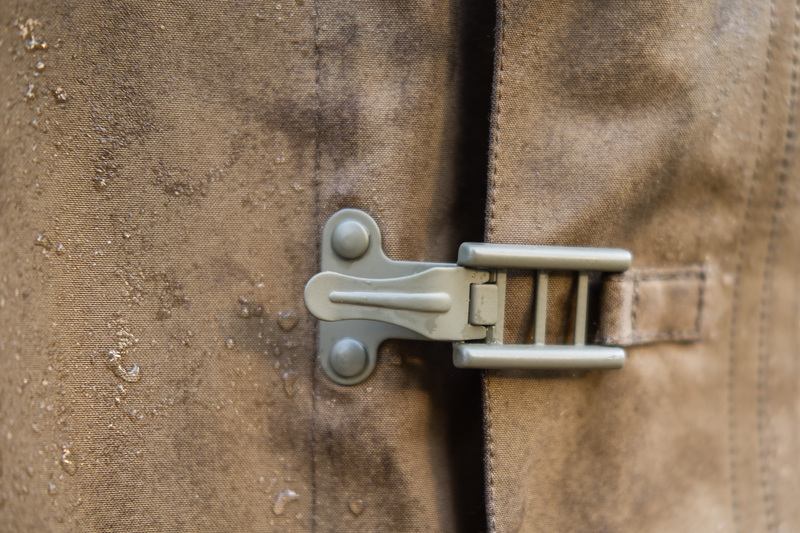 Rubberized cotton aka Mackintosh coat will repel water so very well. However, just like wearing a trash bag will keep you waterproof, it’s very unbreathable, and you eventually get wet from your own sweat. 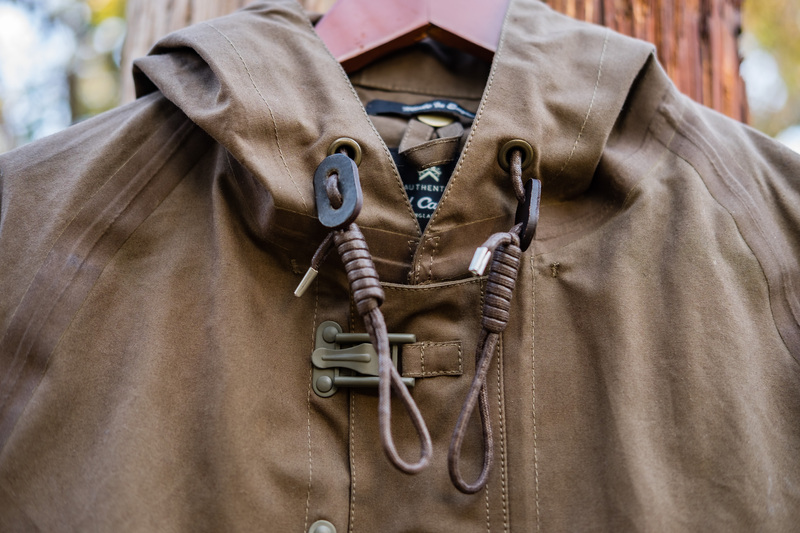 60% cotton/40% polyester or similar blends commonly used on Mountain Parkas is a great lightweight option but is not truly useful in heavy rain. Lastly, the most used today Gore-Tex is not a material but a membrane. 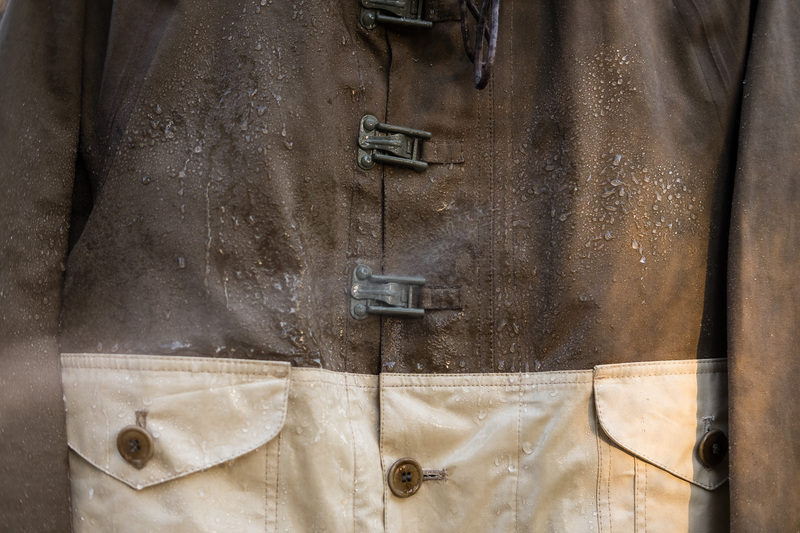 Garments treated with Gore-Tex are truly water proof and also water breathable. The invention of Gore-Tex many decades ago in the 1970s was very innovative and is used very often these days in technical gear. The first thing I noticed with the garment were the printed tags on the jacket. 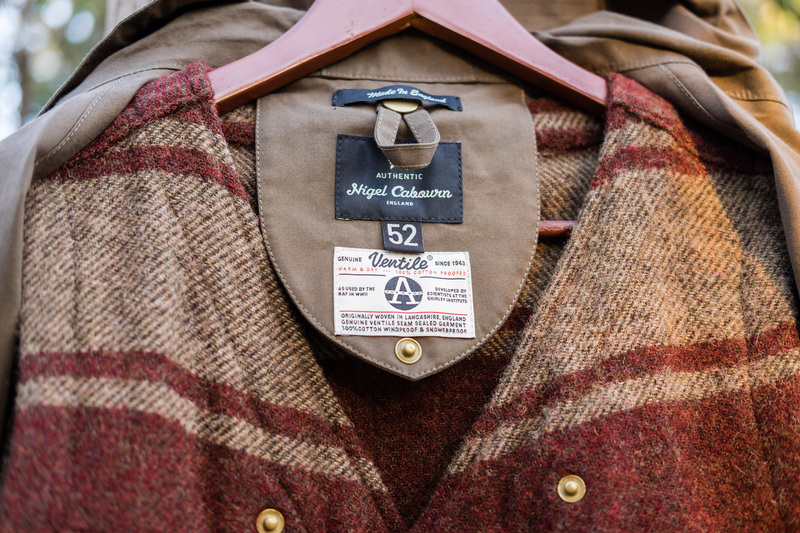 The “Made in England” and “Nigel Cabourn” words were labeled on an impressive, memorable cursive font. On the same tag, a genuine “Ventile” label was present. The Ventile tag mentions “as used by the RAF in WWII” and “developed by the scientists at the Shirley Institute”. However, while the “Originally woven in Lancashire, England” is a true statement, it doesn’t mention Ventile is no longer woven there! 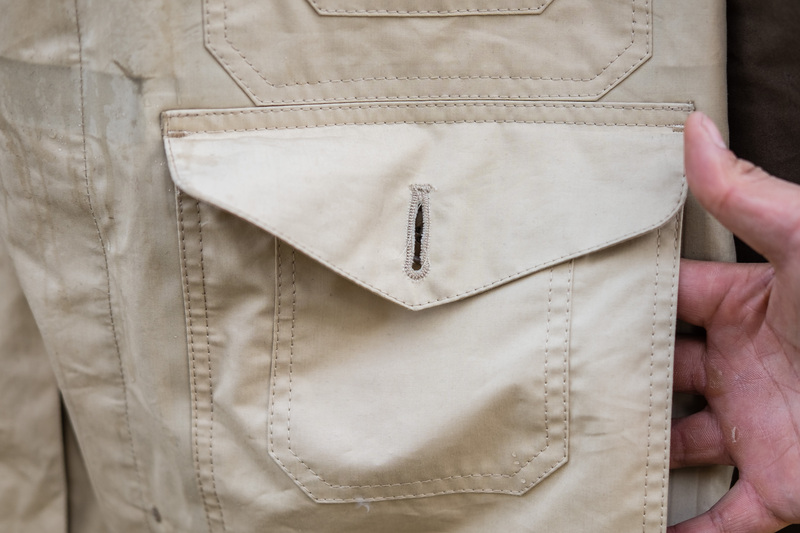 The snap where the vest attaches to also includes a locker loop for easy hanging. My first impression of my cameraman jacket worn is that it was really lightweight! Ventile cotton is quite thin and light, and it also seemed to wrinkle easily. The interior Harris Tweed detachable vest seemed heavier than the whole outer Ventile jacket. The “fireman clips” were matte in color and pretty easy to clasp, and the female portion has multiple holes to clasp into depending how tight you want the jacket. There are 3 sets of clips and the top one is the most burdensome to clasp as it’s as high up as my Adam’s apple! I often fumble to find and close the top clasp. With the jacket on, I have ample room to layer a thick sweater or flannel underneath even with the Harris Tweed vest. The fit of the Cameraman is quite boxy without taper as intended. For what the jacket is supposed to be used for (the outermost layer), I’m fairly positive I sized correctly. For most outerwear, I tend to size for 22-22.5 inches pit to pit which most often correlates with a brand’s tagged Large. 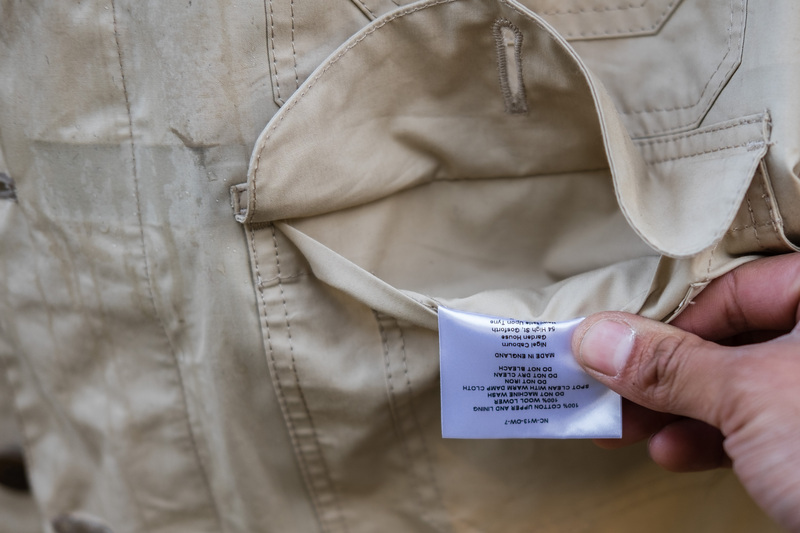 The outer measurements of this garment is 23.5 inches for a tagged size 52, but taking into consideration the inner vest’s added thickness, it’s smaller than that. The outer seams are taped with Ventile to further add water resistance. The areas that are not taped on the exterior are taped on the interior. There hasn’t been a downpour since I received this Cameraman, so I don’t have any experience on how it will fare towards rain! The non removable hood is quite large and has adjustable drawstrings attached. The drawstrings are waxed, tied with a fisherman’s knot, and have metal tips for classiness. The leather drawstring stoppers are very thick and help the drawstrings stay in place once cinched. 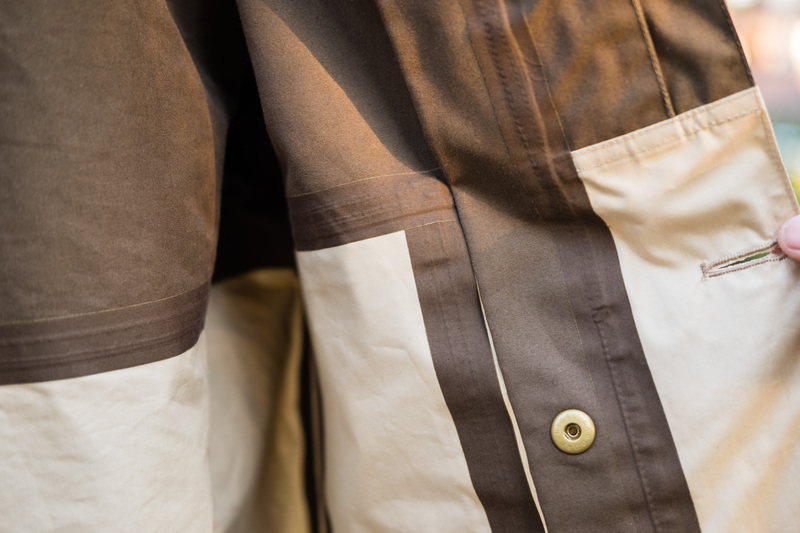 The jacket has a total of 6 closable pockets with a pair of hidden hand warmer pockets. The horn buttons closing all these pockets feel very sturdy. 2 of the small pockets are attached to the exterior of a larger pocket and looks like they are to fit spare camera batteries or memory cards. Of course no garment is really Nigel Cabourn without using Harris Tweed! 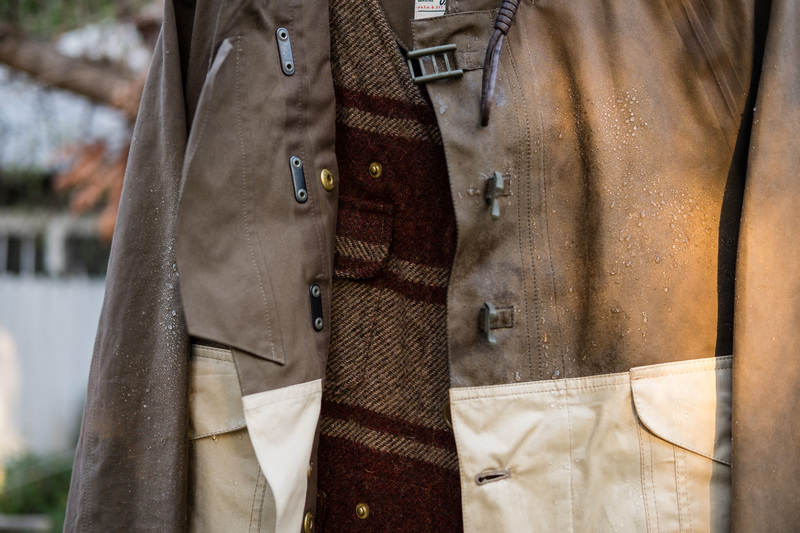 On the inside of the Ventile jacket shell, there’s a detachable Harris Tweed vest in a red/brown striped pattern. Harris Tweed is made from 100% pure virgin wool and the trademark is regulated by an Act of Parliament such that it is only to be woven by the Islanders themselves. Harris Tweed feels quite course to the touch, and the loose weave makes me certain I wouldn’t notice if a moth nibbled on it a bit. The vest’s front is closed by 3 horn buttons that are the same size/color as the horn buttons used on the outer shell. 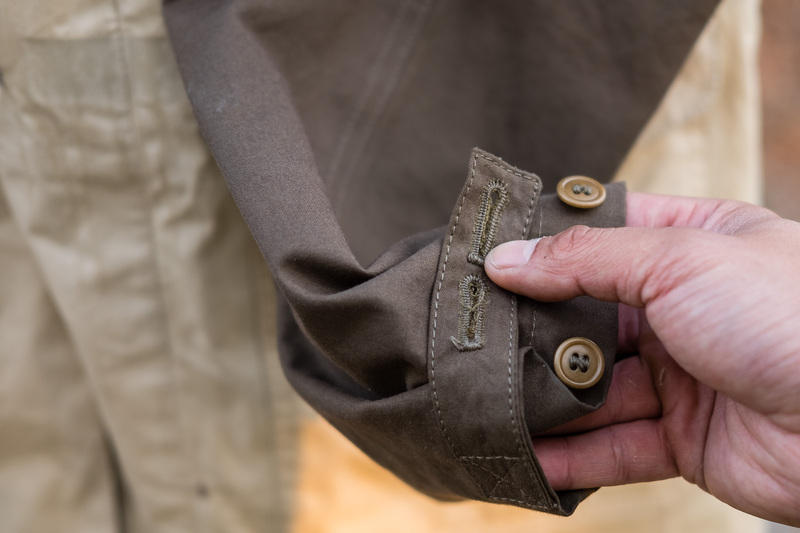 On each front side of the vest, there are 3 snap buttons that attach to the inside of the jacket. The female side of the snap has “Cabourn” printed on it. An additional snap is located behind the neck. Behind every snap is an olive nylon-like piece that spreads the tension of unbuttoning over a larger area so the Harris Tweed doesn’t rip right through. 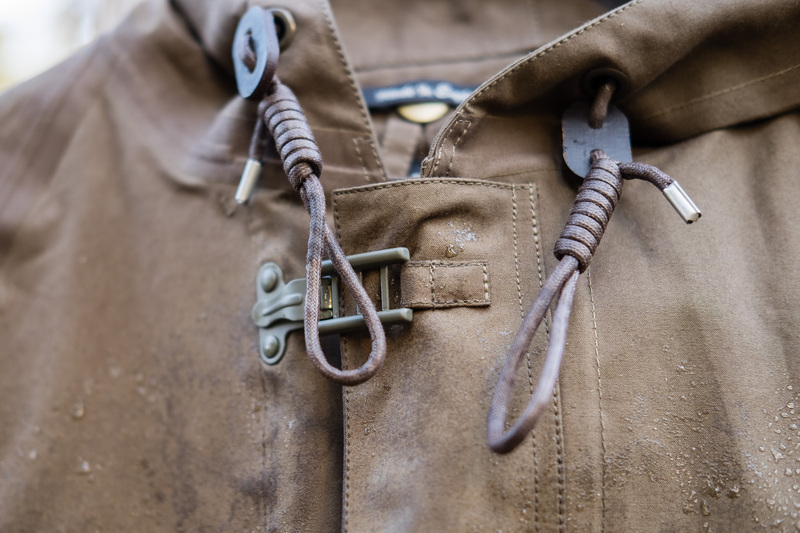 That’s one extra detail that makes Nigel Cabourn’s pieces quality! 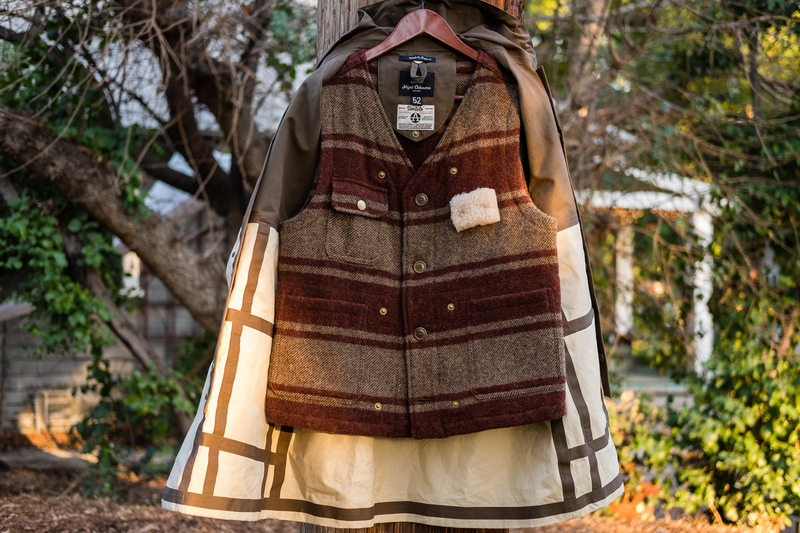 The vest has an upper right flap pocket, a detachable Mouton patch held by two snaps on the upper left, and two vertical pockets. If I wanted to wear the vest as a standalone, the one thing I wished the vest had is side access handwarmer pockets. The Harris Tweed vest holds in heat quite well even though it’s only a vest and one layer. The wrist and its adjustable closure is a bit unusual. I’d imagine a typical jacket to have a wrist closure with one button-hole and two buttons, allowing you to tighten the wrist closure once. However, the Cameraman has two button holes on the tab and two buttons on the wrist that are spaced differently apart. I suppose that allows you more options to fine tune the wrist opening, but so far I’ve typically left the wrists open at their widest for ventilation. When the first real rainy day occurs, I’ll tighten them up! For the price I was able to get the Cameraman Jacket at, I’m pretty satisfied! The Cameraman is an iconic piece from Nigel and is done over and over in different materials and colors. For most pieces, I think the majority of people just wait for the end of the season and purchase Nigel Cabourn discounted. 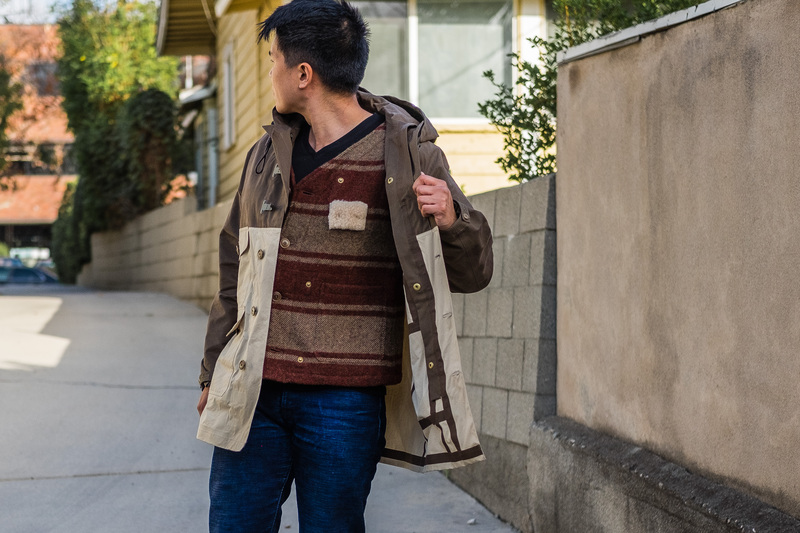 Occasionally, Cabourn does a collaboration that is highly coveted such as with Filson, Red Wing Shoes, or Viberg Boot, and the pieces sell quite quickly even at full price. For example, the Viberg ‘Broad Arrow’ Chukka has had several runs in differing leather types and is priced reasonably around $500 USD (which is actually cheaper than purchasing a boot directly from Viberg! ).